Prototypes. Planned items. Concept art. All of these terms sometimes equal one unfortunate conclusion. They’re applied to a piece of media that never comes to fruition. Yes, The Mask II movie poster and Sega Neptune. I’m looking at both of you. I haven’t gotten over these ‘dead before they were born’ projects. It makes my pop culture loving heart hurt. But we’re not talking about that right now. Today, we’re discussing the illustrious Sailor Moon, the most dynamic, important, and beloved magical girl franchise of all time! Over the course of its nearly 26 years in action, there have been countless Sailor Moon items released to the market. But what happens when a piece of merchandise is teased to consumers, just to disappear back into the world of rumors? That’s what we’re discussing today on Toy Wizards. Join us while we count down our favorite Teased Sailor Moon Items (That Would Never Actually Be Released). Before Sailor Moon S was dubbed into English, Irwin Toys did something very funny. They preemptively released Sailor Uranus, Neptune, and Pluto dolls. This of course, was highly appreciated. Before these dolls were released to US markets, the only place you could see these character’s beautiful faces were in fan subbed VHS tapes or three-second Real Player clip that likely broke your computer. Fans speculated for years what names would be given to Haruka/Michiru/Setsuna (their Japanese civilian names) should the dub ever come to fruition. The names fans “agreed upon” were Alex, Michelle, and Susan. I remember seeing those names everywhere and some fans were even using them in their Fan-Created dubs of the show. Or clips…because the internet was slow and a 4MB AVI file took two days to download. Instead, Iwin Toys released three dolls named Corinn, Narissa, and Celia. The boxes had the Sailor names (Uranus, Neptune, and Pluto) but these civilian names came from a tiny paper pamphlet that was stuffed in the box. Fans were confused, but excited to see the with (albeit odd) Westernized names. Ultimately, the third season of Sailor Moon was dubbed and the characters were named Amara, Michelle, and Trista and the doll name issue was never addressed by Irwin Toys, DIC, or Cloverway. But the doll names weren’t the only Irwin toy with strange origins. 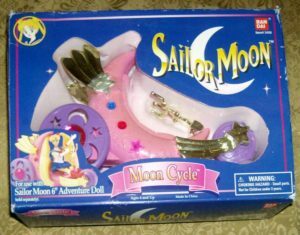 The Moon Cycle is a bicycle style toy meant for the 6” Sailor Moon Adventure dolls. There was never any sort of vehicle that the characters rode on in the show. 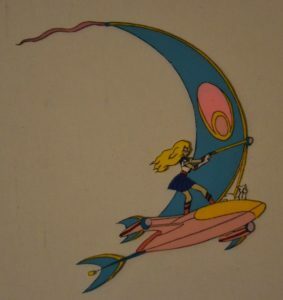 This toy, according to rumor, is a leftover design idea from the scrapped Toon Maker pilot, although we can clearly see those girls riding on flying sailboat…style…things. Irwin continued to drop the ball, exciting Sailor Moon doll collectors with Sailor Moon civilian-style clothing lines that never happened. A Sailor Saturn doll that would never come. And teaser prototype dolls for the Amazoness Quartet, villains from the 4th season of Sailor Moon. While the classic Moon Stick was pretty easy to find at KB Toys in the early Sailor Moon days, there was a secondary item that seemed to be a thing of rumors and legends. It was the Moon Stick Lip Gloss. While maybe fives lucky kids were able to locate this toy item, the rest of us were left in the trash. As far as I’m concerned, this item barely existed, therefore we can sort of count it as a rumored item. Fortunately, America isn’t the only ones at fault here. Japan teased Sailor Moon fans with a picture of this Proplica, only to never release it on store shelves. What’s even more disappointing is that this item was clearly on display. That means it was hanging out somewhere for hopeful fans to see, adore, and want. People were looking forward to buying this thing! Unfortunately, we can deem this locket a beautiful and unattainable prototype. Moonlight dreams really don’t come true. You forgot the Nehelenia doll Irwin was going to do! I think it was Toy Fair 2000. Good stuff! Great article. Yes I still have the catalog shot somewhere. I think my brother scanned it. If by random chance you find it, I would love love love to see! Loryn.Stone@gmail.com please!